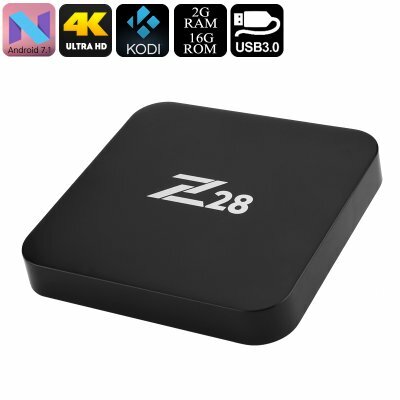 Successfully Added Z28 Android TV Box - 2GB RAM, Qaud Core CPU, 4Kx2K, RKMC Media Player, Miracast, Wi-Fi to your Shopping Cart. The 2GB version of the Z28 TV box has enough power for gaming as well as media playing. This is all thanks to the incredible new RK3328 CPU from Rockchip. The new quad-core processor is clocked at 1.5GHz and with a Mali GPU and 2GB of RAM you can really make the most of games, movies, and apps from the Google Play store. If Netflix, Hulu, and Youtube don't have what you're looking for then open up the RKMC media player. This software offering from RockChip comes preinstalled on the TV Box and brings their own unique flavor of Kodi. This means you will have a rich choice of media options ready to go directly out of the box. Catch up on the latest TV series, watch blockbuster movies and stream the live sports direct to your TV without expensive monthly subscriptions or the need for pay per view services. Featuring an Android 7 operating system this TV box lets you enjoy the most intelligent Google assistant yet and with smarter settings and menus systems it is so easy to navigate even your grandparents could do it. You get 16GB of internal storage on this smart TV box and the micro SD card slot allows an extra 64GB of memory to be added. You can also utilize the USB ports for memory pens or make use of cloud storage and fast Wi-Fi speeds for easy data access. The 2GB quad Core Z28 TV box comes with 12 months warranty, brought to you by the leader in electronic devices as well as wholesale Android TV boxes and media players..